Which? supports McKenzie Friends in Scotland. In a show of support for the Scots public and advocates of wider access to justice in Scotland, consumer organisations such as Which? 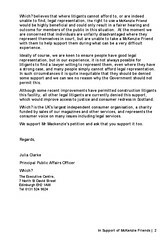 and Consumer Focus Scotland, and law reform groups are rallying to support the 'McKenzie Friend' petition I reported on late last week, which is due to be heard at the Scottish Parliament on 5th May 2009. Diary of Injustice reported earlier on McKenzie Friend petition. As I reported late last week, Mr Stewart MacKenzie, of Perth lodged a petition at the Scottish Parliament “seeking to urge the Scottish Government to introduce a McKenzie Friend facility in Scottish courts as a matter of urgency.” The move is long overdue in Scotland, after it emerged through investigations that McKenzie Friends have been allowed in the English courts for some thirty nine years, while sadly, Scots have been excluded from the ability to utilise the services of a qualified individual at their side during court appearances which might not be possible due to the lack of unrestricted access to legal representation in the Scottish courts system, currently controlled by the Law Society of Scotland. Which? lodged glowing support for McKenzie Friends at Holyrood Petitions Committee. The letter from Which? is clear in its terms of support for the introduction "as a matter of urgency" of McKenzie Friend facility in Scotland. Julia Clarke, on behalf of Which? writes : "We are concerned that the inability of legal litigants in Scotland to be able to draw upon the support of a 'McKenzie Friend' in court is likely to prove a distinct disadvantage to those unable to find legal representation. The system, as you may know, has successfully operated in England and Wales for many years, allowing those who cannot access legal representation to draw upon the expertise of agencies and individuals who can provide such support. Indeed, McKenzie Friends are routinely permitted and are only denied where the judge believes it is fair or in the interests of justice to do so." Which? believes a McKenzie Friend would be ‘highly beneficial’ and result in fairer hearings through lack of legal representation in Scotland. Which?, who have campaigned on legal issues for Scots consumers for a number of years, went on in their letter of support to say : "Which? believes that where litigants cannot afford to, or are indeed unable to find, legal representation, the right to use a McKenzie Friend would be highly beneficial and could only result in a fairer hearing and outcome for members of the public in this situation. At the moment we are concerned that individuals are unfairly disadvantaged where they represent themselves in court, but are unable to take a McKenzie Friend with them to help support them during what can be a very difficult experience." On the subject of the well known difficulties in obtaining legal representation in Scotland, particularly where solicitors exhibit a ‘lack of willingness’ to represent clients interests, Which? added : "Ideally of course, we are keen to ensure people have good legal representation, but in our experience, it is not always possible for litigants to find a lawyer willing to represent them, even where they have a strong case, and many people simply cannot afford legal representation. In such circumstances it is quite inequitable that they should be denied some support and we can see no reason why the Government should not permit this." "Although some recent improvements have permitted construction litigants this facility, all other legal litigants are currently denied this support, which would improve access to justice and consumer redress in Scotland. Which? is the UK's largest independent consumer organisation, a charity funded by sales of our magazines and other services, and represents the consumer voice on many issues including legal services. We support Mr Mackenzie's petition and ask that you support it too." Which? have played a significant role in recent legal reforms in Scotland which helped bring about the Legal Profession & Legal Aid (Scotland) Act 2007, which in turn created the Scottish Legal Complaints Commission, designed to bring an element of 'independent' regulation to complaints against solicitors, which have traditionally been handled poorly and rather corruptly by the Law Society of Scotland during its decades long reign as self regulation of Scotland's legal profession. Consumer Focus Scotland also support McKenzie Friend facility in Scotland. Consumer Focus Scotland, formerly known as the Scottish Consumer Council, also support the introduction of McKenzie Friends to the Scottish courts system, and referred to the issue in their response to the Scottish civil courts review. Sarah O'Neill, a Principal Policy Advocate with Consumer Focus Scotland reiterated the organisation's stance : "‘We would welcome recognition by the Scottish courts of the need for discretion to allow some form of ‘McKenzie friend’ to accompany and possibly represent a party litigant in appropriate cases’." Justice Secretary 'will wait & see' over petition. Justice Secretary Kenny MacAskill was asked for reaction on the McKenzie Friend petition, being reminded that the McKenzie Friend facility has been available in the rest of the UK for some 39 years previous. A spokesman for Mr MacAskill responded by saying : "We have no comment at the moment. As you will be aware, the petition will be considered by the Public Petitions Committee who will decide whether there should be further action. If the Committee ask Mr MacAskill for his opinion he will give it at that stage." John Swinney has been asked to attend & speak at McKenzie Friend hearing at Holyrood. As I reported in my earlier article of late last week, the Cabinet Secretary for Finance, John Swinney MSP, who happens to be the constituency MSP for Mr MacKenzie, has been asked to attend the Petitions Committee hearing of 5th May to speak on the merits of McKenzie Friends, and on his experiences of representing constituents who have endured long suffering predicaments at the hands of the Law Society of Scotland and legal firms, which have been exacerbated by a well known policy operated by the legal profession of denying anyone access to justice in the Scottish courts where the subject matter of the case may conflict with the interests of the legal profession at large. Mr Swinney's office was contacted for a media comment but has yet to issue a formal statement on the Cabinet Secretary's intentions, however, given consumer organisations have already come forward and glowingly supported the McKenzie Friend petition, Mr Swinney is widely expected to speak or issue some kind of support on his constituent's behalf. 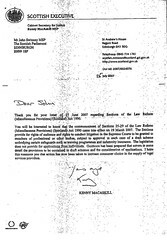 The McKenzie Friend issue is of significant interest to many throughout Scotland who find it difficult or impossible to engage the services of a solicitor or gain access to the courts, either through the cost of such services, or more often obstruction from the legal profession who find it difficult to represent clients in cases which conflict with the general policies laid down by the Law Society of Scotland, particularly when it comes to members of the public attempting to sue another solicitor, as I have widely reported on previous occasions. I am of course, also supporting the McKenzie Friend petition, and urge readers, and anyone experiencing difficulties in obtaining access to justice or access to legal representation to support the McKenzie friend Petition 1247 by contacting the Petitions Committee via their email at : petitions@scottish.parliament.uk . Labels: access to legal services, Consumer Focus Scotland, John Swinney, Kenny Macaskill, McKenzie Friend, Petition 1247, Petitions Committee, Scottish Parliament, Stewart MacKenzie, Which? Law Society 'monopolises' Scots access to court. THIRTY NINE YEARS after laws allowing a 'McKenzie Friend' in the English courts system were introduced to facilitate the public's access to justice by allowing a not necessarily qualified legal individual to assist a person in court, a McKenzie Friend Petition (Petition 1247) has been put to the Scottish Parliament at Holyrood, asking for the implementation of the same privileges of a ‘McKenzie Friend’ to be granted in Scotland, to help many who find it difficult through the current system of legal representation, controlled by the Law Society of Scotland, to secure access to the Scottish Courts. McKenzie Friend petition will end 39 years of prejudice against Scots ‘justice rights’ in Court. 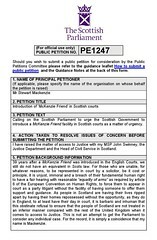 The petition, brought to the Scottish Parliament by Mr Stewart MacKenzie, calls on the Scottish Parliament to urge the Scottish Government to introduce a McKenzie Friend facility in Scottish courts as a matter of urgency. Mr MacKenzie’s case involving the legal profession became famous, when revelations of secret internal memos documenting a claims fixing policy at the Law Society of Scotland, resulted in a televised confrontation between Mr Swinney & former Law Society Chief Douglas Mill during the Justice 2 Committee's investigation of the now passed into law Legal Profession & Legal Aid (Scotland) Act 2007. The memo-gate scandal eventually toppled Douglas Mill as Law Society Chief Executive in January 2008. Mr MacKenzie speaking today to Diary of Injustice said : "I am hopeful the petition will get a good hearing at the Scottish Parliament, and begin the work of ending what is a glaringly prejudicial omission from the public's legal rights & entitlements in Scotland, while people in the rest of the UK have enjoyed and heavily used the right of having a McKenzie Friend accompany them in court hearings for nearly four decades." Cabinet Secretary Swinney will be asked to speak to Holyrood committee on the merits of McKenzie Friends. It emerged today, the Scottish Parliament's Petitions Committee has set a 5th of May hearing for the petition, but has not granted Mr MacKenzie the right to give oral evidence, to which the petitioner replied : "Since I am not being allowed to speak on the merits of my own petition, I have asked my MSP, Cabinet Secretary for Finance, John Swinney, to attend the Petition Committee hearing and speak on my behalf, as he has done so with considerable care and attentiveness on previous occasions." In England & Wales, the concept of a McKenzie Friend has existed for some 39 years, assisting people in court, who find it difficult to obtain legal representation either through cost or other reasons. • Quietly give advice on: points of law or procedure, issues that the litigant may wish to raise in court, questions the litigant may wish to ask witnesses. 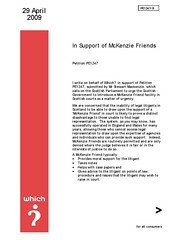 Mr Stewart MacKenzie's 'McKenzie Friend' Petition reads as follows : “39 years after a McKenzie Friend was introduced in the English Courts, we still do not have an equivalent in Scots law. For those who are unable, for whatever reasons, to be represented in court by a solicitor, be it cost or principle, it is unjust, immoral and a breach of their fundamental human right to have a fair hearing with reasonable “equality of arms” as required by Article 6 of the European Convention on Human Rights, to force them to appear in court as a party litigant without the facility of having someone to offer them support and guidance. Justice Secretary MacAskill criticised over his own failure to reform access to justice. While many of the failures to implement the 1990 access to justice legislation can obviously be pinned on previous Scottish administrations who stood by while the Law Society in effect dictated policies on restricting the individual’s right of access to legal representation and the courts, the current Justice Secretary, Kenny MacAskill, and the Scottish Government have done very little, if anything to improve the lot of members of the public who simply cannot get into court because the legal profession feel it is not in their best interests to allow such cases to go forward. Justice Secretary’s leaked letter promised cabinet colleague John Swinney that access to justice was happening two years ago. The road to reforming access to justice in Scotland has been a rocky one so far, as almost all attempts to-date of implementing changes allowing the Scots public increased access to justice and the Scottish Courts, have either been thwarted by the legal establishment, or held in political limbo by an exceedingly uncooperative Justice Secretary Kenny MacAskill, who despite promises to Cabinet colleague John Swinney, two years ago in 2007 that change 'was on the way', has in reality made things very difficult for anyone other than solicitors to enter the Scots legal services market to this date and no doubt beyond. High Court Judge Lord Hardie while serving as Lord Advocate, wanted to repeal Scots access to justice legislation. However, while the prickly thorn of reforming access to justice falls to the current Scottish Government to act upon, the legal establishment’s attitude to counter any reforms to increased access to the Scottish Courts go back years, as I revealed in an earlier report where in 1997, the serving Lord Advocate at the time, Lord Hardie, himself advocated repealing the laws which allowed increased competition in the Scots legal services market, which had actually been kept from the public by an intense campaign ran by the Law Society of Scotland for over seventeen years, seeing Sections 25-29 of the Law Reform (Miscellaneous Provisions) (Scotland) Act 1990 only implemented in March 2007 after public queries and the release of documents through Freedom of Information laws which revealed the secret campaign by senior law figures and civil servants within the Scottish Executive to withhold or repeal the access to justice legislation. Given the lack of willingness on the part of the current Scottish Government to speedily reform the Scots legal services market, leaving many clients out in the cold in terms of legal representation, many Scots caught up in legal difficulties feel with some justification, their rights are being impugned by both the legal profession and the Government simply to protect solicitors long held monopoly over access to justice. 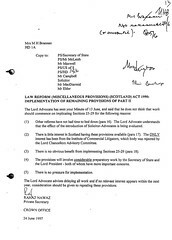 Clearly the Scots public could benefit from the McKenzie Friend facility being applied to Scots Law, and as with other legal reforms long overdue, the Scottish Government should act without delay and reverse the 39 year prejudice against ordinary Scots obtaining access to courts, while our English counterparts have enjoyed the use and privilege of a McKenzie Friend at their side. I therefore look forward to reporting on and watching how the McKenzie Friend petition progresses through the Scottish Parliament .. as surely the public interest of access to justice comes first over protecting solicitors business markets & profits. Law Society 'happy' over challenge against asbestos laws. Scots law firm Brodies LLP, acting for the big insurers, Avira, AXA Insurance, RSA, and Zurich, have launched a legal challenge in the form of a judicial review against The Scottish Government’s Damages (Asbestos-related Conditions) (Scotland) Act, which passed the Scottish Parliament despite Tory opposition in a 98-16 vote and received Royal Assent last Friday. The legal challenge to Scotland's law making powers, comes amid insurers claims that the new law, which makes it easier for victims of asbestos related illnesses to claim compensation, contravenes the European Convention on Human Rights and insurers' economic rights. However, can an insurer claim their Human Rights are being breached when it might just turn out those same insurers in respect of many other claims, do not respect the Human Rights of claimants or customers. Simply, what we have here, is big business & corporations claiming their own human rights are being breached because they will have to pay out money to asbestos victims in Scotland, while not having to pay out in England & Wales because the House of Lords ruled in their favour that ‘pleural plaques’ do not qualify for compensation. It was this House of Lords ruling which prompted the Scottish Government to introduce the Damages (Asbestos-related Conditions) (Scotland) Act, arguing pleural plaques were symptomatic of asbestos exposure. Insurers challenging asbestos law also insure Alex Salmond’s Scottish Govt. Some of the insurers who are participating in the legal challenge against Holyrood’s law making powers, have links to the SNP minority controlled Scottish Government, as you can see in my earlier report. At least one of the insurers, Royal & Sun Alliance is identified in papers showing insurance deals between, among other insurers, the RSA and Alex Salmond’s administration to provide indemnity insurance cover for quangos created by Ministers and also claims protection for the Government Legal Service for Scotland (GLSS). Law Society threatened legal challenge against parliament in 2006. The last time the Scottish Parliament's law making powers were threatened on such high profile legislation occurred in 2006, when the Law Society of Scotland's then Chief Executive, Douglas Mill unbelievably claimed that new legislation in the form of the Legal Profession & Legal Aid (Scotland) Act 2007, created to independently regulate Scotland's 10,000 solicitors contravened a lawyers human right to regulate complaints against themselves. Despite bringing forward an English QC to claim a human rights breach under ECHR, the Law Society's legal challenge never proceeded, however, lawyers did have their way, and the LPLA Act was heavily compromised through amendments insisted by the Law Society of Scotland, with the help of certain politicians within Holyrood known to be sympathisers of, and some suspect financial beneficiaries of the legal profession. This time around, the insurers have support from the Scottish Conservative Party, who among their ranks, Bill Aitken MSP, Chairman of Holyrood's solitary Justice Committee after Mr Salmond scrapped the second Justice Committee, fearing opposition control. Mr Aitken apparently believes the asbestos claims law which will force insurers to pay out over pleural plaques, is ill conceived. Mr Aitken of course, has a long background in the insurance industry, as his Scottish Parliament profile reveals. Incidentally you can read more about other things the Royal Sun Alliance get up to HERE. MacAskill claims he will defend his asbestos claims law against his own colleagues action. The Scottish Government, no doubt in the form of Justice Secretary Kenny MacAskill claimed today that they will ‘defend the action vigorously’, but what a slap in the face to the SNP it will be if the Court of Session do give the insurers their wishes. To make matters worse for Mr MacAskill, a legal insider indicated tonight, the Law Society of Scotland were apparently “happy” over the legal challenge against the asbestos claims legislation, one senior official stating “Its about time Holyrood got it in the neck” … indeed, but many of us might just be wondering isn’t it about time the Law Society got it in the neck ? At the end of the day it comes down to the attitude we are used to seeing in the professions, be it banks, lawyers, or insurers, that money comes before lives, and there are plenty of Scottish legal firms happy to indulge big business and the insurers in that argument, giving a very potent signal to the public that access to justice is only obtainable through corporate wealth, or corporate agreement, and woe betide anyone who is too poor, or requires the use legal aid to secure a smidgeon of court time to pursue life threatening medical conditions which the insurers want killed off .. along with their victims to avoid making any compensation payments. Money before life in Scotland today … and all because lawyers and their insurer supporters say so. How does that make you feel ? Britain's biggest insurance firms have lodged a legal challenge against a new law which allows Scots workers suffering from exposure to asbestos to sue for compensation. Aviva, AXA Insurance, RSA, and Zurich have lodged an action for a judicial review at the Court of Session in Edinburgh of the Damages (Asbestos-related Conditions) (Scotland) Act which received Royal Assent only last Friday. The act allows claims for compensation for people affected by pleural plaques. The insurers insist clinical evidence shows plaques are symptomless, do not impact on health or lead to asbestos-related diseases and the legislation overturns a House of Lords decision made in a case two years ago. They claim the act ignores "overwhelming" medical evidence that plaques do not cause asbestos-related conditions such as mesothelioma, overturns a fundamental UK legal principle that compensation is payable only where physical harm has been suffered through negligent exposure to a risk and fails to fully assess the financial impact on Scottish firms. Nick Starling, of the Association of British Insurers, said the action had not been taken lightly and claimed the legislation was "ill conceived" and ignored the fundamental legal principle of negligence and clear medical evidence. A government spokesman said it would "vigorously defend" the challenge. He said: "We are disappointed that this action to seek effectively to overturn the will of the Scottish Parliament has been taken. "The insurance companies' action may delay, but will not ultimately defeat, our resolve to defend the rights of people who have been negligently exposed to asbestos by their clients. We firmly believe that our legislation is right in principle and right in law." Law Society puppet tribunals protect crooked lawyers. 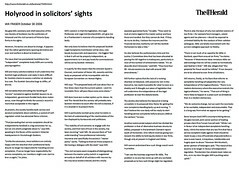 Consumers of legal services in Scotland remain as unprotected as ever from the crooked element of the Scottish legal profession, as the media report the latest failure of self regulation by the Law Society of Scotland & the Scottish Solicitors Discipline Tribunal, that of allowing well known solicitor John G O’Donnell, from Glasgow, to remain in practice, despite a trail of client complaints and deception stretching back years. Sunday Mail previous report on claims against John G O’Donnell. Mr O' Donnell, is still facing over 21 client claims for negligence against his work as a solicitor, but while the SSDT and the Law Society have pursued the complaints, and issued one of the weakest punishments available to them, the damages claims for negligence, which are being handled by the Law Society's infamously corrupt Master Insurance Policy remain to be settled, and as one ex-member of staff from the Law Society said this morning "will probably take years to settle". .. and for all that, no fine, and only a restricted practising certificate ! Philip Yelland, in charge of standards at Law Society for years, but still plenty of John G O’Donnells & Andrew Penmans. 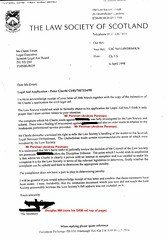 As you can see from the decision handed down by the puppet Discipline Tribunal, Mr O’Donnell, like many other solicitors who handle their clients affairs so badly, has been allowed to remain in practice, and the only reason this case got to the Tribunal was because the Sunday Mail was keeping tabs on the case. If there had been no media attention, it is highly likely that Mr O’Donnell, just like many other lawyers, some even charged with criminal offences, would have walked free after a complaints whitewash from his legal colleagues at the Law Society of Scotland. It is of note there is not one shred of concern for the clients or their many claims for negligence, currently being strung out, delayed, meddled with, fiddled with, and generally wiped out by the dirty tricks department of the Law Society, of which many of us have come to know and experience over the years. SLCC of no help to victims of O'Donnell. Asked today if the Scottish Legal Complaints Commission would be of any help to the many victims of Mr O'Donnell, a legal insider said "The Scottish Legal Complaints Commission are about as much use as a dead duck. They have spent most of their time so far doing what is best for themselves, and have passed most complaints back to the Law Society simply because they are too hot to handle." He went on "I don't see how the SLCC can justify their existence when all they have done is grumble about the size of their salaries, threaten to resign just because they had no Personal Insurance cover, and are trying to avoid taking up most of their responsibilities to protect clients from the likes of O'Donnell, while charging the legal profession and soaking up public money like a sponge." Sensationally a retired solicitor, sickened by the constant scandals within the legal profession spoke out last night, warning the public they would have to do more against crooked lawyers or face their own legal problems when they needed a solicitor. He said : "As long as solicitors don't fear regulation, there will always be 'crooked lawyers' out there getting away with whatever they can. Just look at what Mr O'Donnell has been up to, and the time it has taken the Law Society and the SSDT to do something, which at the end of the day amounted to a slap on the wrist." Scottish Government accused of looking the other way on crooked lawyers. He also went on to accuse civil servants within the Scottish Government, and politicians of allowing the legal profession to circumvent the rights of clients whenever they felt like it. He said : "I was a solicitor for 30 years, and its no secret among us the Law Society, civil servants & Ministers within the Scottish Government share a common purpose in preventing fully independent regulation from being a reality and ensuring proper oversight of what you regularly describe, with some justification, as a thoroughly corrupt legal profession." An official with a consumer group said : "If you think about it, it's almost as if paedophiles can call up Government Ministers or civil servants and get them to drop charges against them. That is the extent of what happens between the Law Society and Scotland's elected lawmakers. A cosy relationship that neither wish to end because its been so profitable to both in the past, and be warned, they will do anything to protect it." Kenny MacAskill defends the O’Donnell’s of his beloved legal profession at all costs, regardless of their victims plight. ONE OF Scotland’s worst lawyers has been forced out of business by legal watchdogs. John O’Donnell, 58, was accused of having “contempt” for the Law Society of Scotland by repeatedly snubbing clients and ignoring complaints. He has been banned from working unsupervised for five years by the Scottish Solicitors’ Discipline Tribunal (SSDT). It means he can no longer run his own law firm but can still work as a lawyer. The Sunday Mail first exposed O’Donnell five years ago when cops probing an alleged money laundering gang raided his John G O’Donnell & Co office in Cathcart, Glasgow. We revealed he faced at least 21 negligence complaints and compensation claims of more than £1million. But it took until last year for the SSDT to find him guilty of six counts of misconduct including breaching money laundering rules. O’Donnell claimed he suffered depression but had a clean bill of health and got off with a £500 fine. He was finally forced out of business by an SSDT ruling in February, details of which were only released last week at the Sunday Mail’s request. O’Donnell, who did not return our calls for comment, is trying to sell his business before the ban begins on June 1 but can still advertise his services until then. Scottish Legal Complaints Commission ‘now as corrupt as the Law Society'. 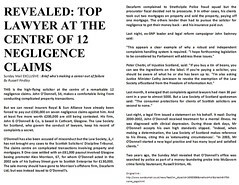 Revelations of a whitewashed internal investigation into complaints made against the conduct of solicitors & officials personally appointed by Justice Secretary Kenny MacAskill to the Scottish Legal Complaints Commission, show the beleaguered law complaints body has turned into little more than a cruel clone of the Law Society of Scotland, made famous over the years in its own role for protecting crooked lawyers from client complaints. SLCC Chief Jane Irvine. The internal investigation, conducted by SLCC Chair Jane Irvine herself, amazingly found that a series of discussions & emails documenting members drunken conduct, which extended into bitter hate fuelled rants against consumer groups & law reform campaigners were a result of “free discussion of ideas amongst Board members and staff” rather than offences meriting disciplinary hearings and a clean up of the now little regarded law complaints body. How it all started as I reported on the board members antics. Jane Irvine’s brief investigation of her own highly paid colleagues conduct, ran only to a few lines, completely exonerating members email insults towards consumer campaign groups, law campaign reformers & political parties, and Ms Irvine even went on to claim that board members email smears against claimants to the Law Society's infamously corrupt Guarantee Fund “were not defamatory”, while the actual emails reveal SLCC officials revelling in bitter hate fuelled rants against consumer groups & members of the public. Jane Irvine said of her investigation into her own colleagues : “I have carefully examined the complaint you have made. I do not consider that it can be upheld. At base the copy records released to you under one of your FOI requests to us simply show working communications during an open process of discussion of process matters. As I have already confirmed to you I encourage open and free discussion of ideas amongst Board members and staff. So, as we see, the Scottish Legal Complaints Commission is nothing more than a costly mistake and repeat of the Law Society of Scotland.No justice for consumers and no protection against the criminal element of the legal profession, whom the SLCC seem just as willing to excuse as their counterparts over at the Law Society regularly do. Justice Secretary Kenny MacAskill had no power to intervene. The deal to clear members of their outrageous opinions & rants against consumer organisations & political groups was apparently struck after it turned out the Justice Secretary Kenny MacAskill, was powerless to intervene in the widely reported antics of lawyers he himself had appointed to the law complaints body, due to the fact he had failed to implement a code of conduct for members before they began work. Mr MacAskill’s unwillingness to make a disciplinary complaint against the conduct of his own ministerial appointees is understandable, given the fact there is no enforceable regulatory framework in place for SLCC board members, an omission on the Justice Secretary’s part which increasingly seems as if it was more of a deliberate policy, than an oversight, leaving conduct & regulation of the SLCC itself off the books for as long as possible. How the media reported problems at the SLCC. However, not everyone at the Scottish Government takes that line, as a source commented : "Several of my colleagues accept this commission is a mess and there should have been action taken over what appeared in the papers, but Ministers wanted to keep publicity to a minimum as the SLCC is currently presenting its budget to the Scottish Parliament, and the Justice Secretary could do without any awkward questions on what officials at the commission have been getting up to." An official from a consumer organisation who did not want to be identified said :"The Scottish Legal Complaints Commission in its current state is doing very little for consumer protection or restoring morale in the legal profession as it should have been well into by now over a year on from creation." He went on :"Several organisations which have observed the SLCC's lack of progress to-date, when the issues it should be dealing with are very clear, feel it is not the consumer champion which was proposed in legislation. Consequently the public have been led up the garden path with claims this would be a new start in regulating the legal profession which it definitely is not.". I would point out that since the Prime Minister has taken responsibility & apologised for a similar email smear affair at Westminster, carried out by advisers working on their own who have now resigned over their conduct, the SLCC Chair and board members who, widely and apparently quite happily discussed the smears against consumer groups & law reformers, should do the honourable thing and issue apologies too. However, the SLCC’s refusal to even apologise for its members & officials wholly unacceptable conduct, smacks of the arrogance and self protectionism which emanates from the remarkably corrupt regulatory policies of the Law Society of Scotland, which the SLCC was itself designed to clean up. SLCC staff ‘censored’ over whistle blowing. In a sinister twist to the story, a source close to the SLCC came forward last night and indicated some SLCC staff have been privately WARNED that if they talk to the media about their work or problems at the discredited law complaints body, they face criminal charges under a legislative clause known as Section 43, which the Law Society of Scotland insisted be contained in the Legal Profession & Legal Aid (Scotland) Act 2007, making it a criminal offence for staff to whistle blow on the failings or corruption inside the SLCC. So there we have it. 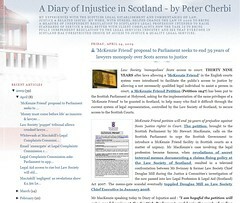 Those who were or are expecting a measure of justice through the Scottish Legal Complaints Commission’s presence in regulating the legal profession, will have to look elsewhere, as this organisation, unregulated and unchecked in its actions, has simply copied the Law Society of Scotland and whitewashed its own anti-client anti-consumer attitudes from public scrutiny. Surely this is as good an indicator to the public if any is needed, that this commission’s motives & allegiances still lie with protecting the legal profession rather than the consumer’s best interests. 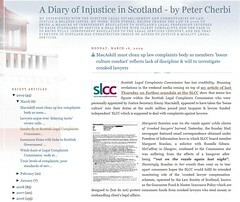 A regulator such as the SLCC, which covers up its own dirty linen, has no productive role to play in the community other than to further the greed & corruption of the Scots legal profession it was supposedly put there to regulate, and which has yet to find a cure in a fully independent regulator, which for now, the Justice Secretary and the minority SNP Scottish Government are resisting tooth & nail. SLCC members & officials engaged in bitter smear tactics against public groups. While the controversy still rumbles on over the email smear-gate scandal involving former Downing Street Adviser Damien McBride & the Conservative Party, disciplinary action is now been demanded over a similar email smear campaign from within the 'independent' Scottish Legal Complaints Commission, where Ministerial appointees engaged in bitter hate fuelled email smear exchanges against consumer groups & campaigners in attempts to exclude them from the commission’s objective of protecting the public against rogue lawyers, while the legal profession was apparently allowed ‘a free hand’ in policy discussions. How the media and I reported the email smear campaign at the SLCC. While there seems no indication the Damien McBride emails spread to others higher up the chain of command, and probably were not known about by the Prime Minister himself, the bitter hate fuelled rants of SLCC board members were spread and copied throughout the organisation, with the Justice Secretary Kenny MacAskill himself being made well aware of the anti-consumer culture which has infected the SLCC at all levels, even to the point where his own appointees to the commission embarked on Law Society style anti-client rants to destroy the credibility of financial claims for damages against rogue lawyers. John Swinney championed consumer protection against lawyers, but Kenny MacAskill allowed lawyers rights to 'run amok' at new complaints body. 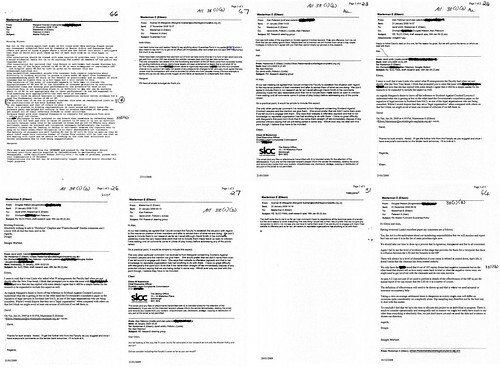 The bitter email smears & rants expressed by the SLCC’s board members & officials also appear to have a political connection, as insiders to the organisation now allege the failures within the commission which have allowed such an anti-consumer culture to develop, has now turned the beleaguered complaints regulator into a cesspit of political infighting where the organisation's failure is being blamed squarely on the current Scottish Government and the Justice Secretary himself. MacAskill still to act over SLCC email smear scandal. In comparison to the current inaction from Justice Secretary Kenny MacAskill over SLCC’s email tantrums, the head of the Civil Service at Westminster, Sir Gus O'Donnell today said in connection with the Damien McBride emails that "strengthened" guidance had been issued to department heads on codes of conduct on Wednesday, and that special advisers caught "disseminating inappropriate material" are to be automatically sacked under new rules. In that case, the same should apply to the actions of those at the Scottish Legal Complaints Commission, whose actions have badly damaged the law complaints body’s public credibility and have brought the commission into disrepute. Who among the highly paid SLCC members & officials will now do the decent thing and resign over their astoundingly poor conduct ? If there are no resignations, it is clear that sackings should be the order of the day, to send a clear message to everyone that the legal profession's traditional bitter resentment of consumer organisations and clients best interests have no place at the SLCC, which was created to clean up the long term cronyism in complaints handling by the Law Society of Scotland, which consistently allowed crooked lawyers to remain in practice while unsuspecting clients fall ever more into the trap of poor legal service and widespread, well organised frauds by dishonest solicitors against the public. Scottish Legal Complaints Commission budget hits Holyrood. The Scottish Legal Complaints Commission, charged with protecting consumers from the Law Society of Scotland's 'massed ranks of crooked lawyers', has finally put its 2009-2010 budget before the Scottish Parliament for approval, revealing a substantial drop in costs from the original budget for the Commission’s first year of operation was £3,493,823 in the Commission's first year of operation, to £2,112,149. for 2009/2010. Justice Secretary Kenny MacAskill gifted lawyers a staggering £2.5 million of taxpayers money to start up the SLCC. It is worth noting that while the commission consulted elements of the legal profession who fund its operation on the budget and scale of fees, along with other operational matters, the SLCC did not consult the Scots public, who via Justice Secretary Kenny MacAskill, pumped in a staggering £2.5 million of taxpayers money into the 'do nothing' law complaints quango, which has so far done little to reverse public mistrust of Scotland's poor performing and widely viewed as crooked legal profession. SLCC CEO & former Law Society Committee member Eileen Masterman gets £1,350 per week. High calibre candidates for the SLCC ... where on earth shall such people be found ? from the legal profession perhaps ? and with whopping salaries such as the SLCC’s Chief Executive Eileen Masterman at £1,350 per week and others at the commission on £350 a day, where is all the money going when the commission is sending most complaints it has currently received back to the Law Society for more closed shop whitewashing of complaints against crooked lawyers. And yet with the millions of pounds of expenses being handed out the first decision the SLCC took was not to investigate any complaint against a lawyer prior to 1st October 2008, after 10 months of meetings at £350 a day each ! Legal Aid to rise, but access still dodgy if you are suing a professional. Justice Secretary Kenny MacAskill announced today some welcome rises in access to legal aid, where anyone with a disposable income of £25,000 or less will be eligible to apply for civil legal aid (unless the applicant happens to be suing a professional, such as a lawyer, doctor, accountant or any other member of a profession or public body coincidentally insured by the same insurers as the legal profession. However, the long awaited changes to legal aid entitlements, while announced today, face many criticisms from not only consumers but also from the legal profession itself, where even some solicitors describe the ‘rise’ in legal aid as more of a loan to pay their legal bills, rather than raising entitlements. MacAskill : Not much change for legal aid claims in reality : "The Scottish Government is determined to use the powers at our disposal to help those facing difficult and uncertain times during the current economic slump.We have taken a series of steps to help hard-pressed families and businesses, to improve financial advice to vulnerable individuals and to stimulate growth in the economy. "Today we will, at a stroke, bring one million more Scots into potential eligibility for legal aid, where previously their disposable income automatically ruled them out of being considered. We believe the change is long overdue as the system has for many years unfairly excluded people of relatively modest means from pursuing what might be a complex and expensive legal action.The reformed financial eligibility limits, including a tapered contribution regime, provides a fairer system which can help many more people at just the time they might need it most." Law Society of Scotland will intervene against legal aid claims. Just try suing a lawyer or a professional on legal aid and see how far you get. Hundreds of people over years have come to me with such a situation, and guess what ? the Law Society of Scotland has killed off their legal aid at every turn ... although only when their case was about to get to court, to make sure their own solicitor could dredge as much civil legal aid for advice & assistance before actually dumping the poor client in the street on orders from the Law Society's HQ in Drumsheugh Gardens, Edinburgh. Scottish Government & Law Society still blocks legal aid access to cases suing professions & public bodies. Strangely enough, people even trying to sue a bank or a doctor or an accountant whose actions had totally financially ruined them, leaving some victims in receipt of benefits, still couldn't obtain legal aid ... and all because the so-called 'professional' they were up against, used their professional muscle with the same Scottish Government to quash the client's legal aid applications .. which Mr MacAskill knows all about but does nothing about. So what actual use is the legal aid rise, Mr MacAskill ? Will people actually be able to put in a claim for legal aid this time without professions, banks and business being able to stop their claim simply because they don't want a few bad headlines in the press about throwing people out of their homes ? Are you actually going to allow those who need legal aid a level of decency in life and access to justice which so far you, and some of your colleagues in the legal profession have denied most of us for all these years ? Douglas Mill intervenes with SLAB. proving lawyers will make it their business to kill off a legal aid claim. As an example to all, my own personal experience with legal aid involving the well known case against the Law Society of Scotland and crooked Borders lawyer Andrew Penman of Stormonth Darling Solicitors in Kelso, which saw the then Law Society Chief Executive Douglas Mill step in to personally thwart my legal aid claim to expose the corruption at the Law Society which reversed a prosecution of Penman for what he did to my family. This is the reality of access to legal aid in Scotland, rather it is no access to legal aid when it comes to pursuing a case against a ‘professional’ who has ruined your life for their own financial gain. More window dressing Mr MacAskill ? How unbecoming of a Justice Secretary there to help the people of Scotland …. The Scottish Government today extended legal aid rules to one million more Scots – enabling them to apply for financial support when protecting their housing, employment and family rights. Anyone with a disposable income of £25,000 or less will be eligible to apply for civil legal aid. The previous limit was £10,306. Ministers pledged the change - meaning that around three-quarters of all adults will potentially be eligible for legal aid - in November, as part of their wider support for people during the economic downturn. The Scottish Government is also investing an additional £3 million to enhance the national availability of advice and representation, including people at risk of repossession. Justice Secretary Kenny MacAskill said: “The Scottish Government is determined to use the powers at our disposal to help those facing difficult and uncertain times during the current economic slump. “We have taken a series of steps to help hard-pressed families and businesses, to improve financial advice to vulnerable individuals and to stimulate growth in the economy. “Today we will, at a stroke, bring one million more Scots into potential eligibility for legal aid, where previously their disposable income automatically ruled them out of being considered. “We believe the change is long overdue as the system has for many years unfairly excluded people of relatively modest means from pursuing what might be a complex and expensive legal action. “This opens up access to justice for more people and is particularly welcome news in a difficult economic climate. “This substantial increase in financial eligibility for civil legal aid will help people who previously would not have been able to afford to pursue or defend their case. 1. Civil legal aid provides funding for a solicitor to take a case to court, including preparation and the hearing itself, as well as funding for advocates and experts if needed. 2. Financial eligibility for legal aid is means-tested on an applicant's disposable income (including deductions for maintenance payments and childcare or travel costs associated with work, as well as an allowance for the costs of providing for dependants) and capital assets (including savings and investments, but not their home). * plus 100% of any disposable income over £15,001 up to the upper limit of £25,000. 4. To date around 43% of Scottish households are potentially eligible to access civil legal assistance under the legal aid scheme. The rise in upper disposable income limit to £25,000 will bring this to around 74%. Financial eligibility tests in England and Wales are not directly comparable. However, the monthly disposable income limit for legal aid south of the border is approximately equivalent to £8,376 over one year and the estimated eligibility rate in 2007 was around 29% of households. 5. In addition to financial qualification, applicants must meet two other statutory tests: they must have a legal basis for the case and it must be reasonable in the particular circumstances of the case that they should receive legal aid (e.g. it may not be reasonable to grant legal aid to enable the applicant to sue someone who has no resources or where the applicant is able to receive financial help from other sources such as a trade union, insurance company or professional body). 6. In November the Deputy First Minister announced an additional £3 million over two years to enhance the availability of legal advice and representation for people facing repossession and other problems, such as debt, through In-Court services, and assistance provided by local solicitors, advice agencies and Scottish Legal Aid Board. 7. A Repossessions Group, established by Ministers to examine other measures to support homeowners at risk of losing their home, is due to report to Ministers by the end of April. 8. In January Minister for Community Safety Fergus Ewing established the Debt Action Forum, a panel of experts chaired by the Minister to examine information and initiatives on debt relief, debt advice and repossession and recommend a package of legislative and non-legislative measures to tackle the issues. He also announced improvements to the Debt Arrangement Scheme which helps people with disposable incomes to pay back their debts over a longer period, free from the threat of legal action.